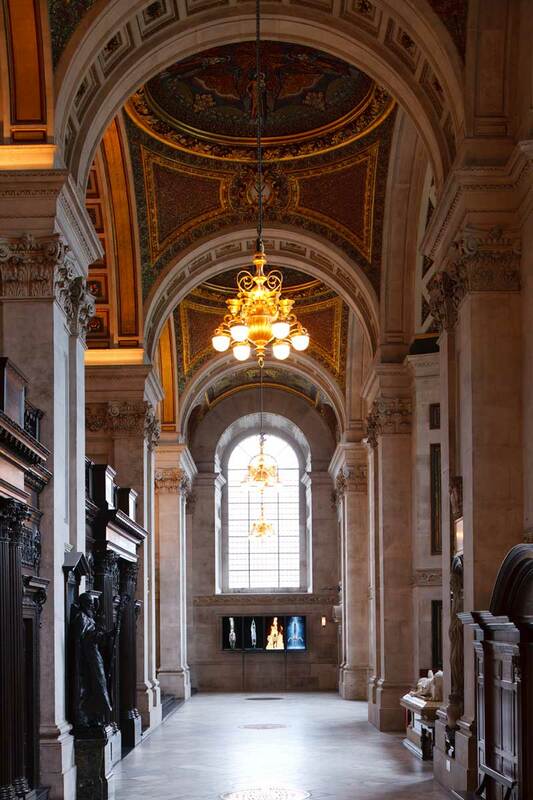 At the eastern extremity of St Paul’s Cathedral’s south quire aisle, four plasma screens are lined in a neat row, set into a modish Norman Foster stand. They are gearing up to play Martyrs, a new work by Bill Viola specially commissioned for the cathedral. It is the first moving work of art ever to be set up permanently in a British church. The first video shows a pile of earth, a fine spiral of dust being sucked into the air above it by a force unseen. In the second, a woman in a white dress dangles upright, tied to a rope hung out of shot. The next has a man sitting in a chair in a circle of tiny, flickering flames and on the final screen, a young man lies in the foetal position, a rope like the one in the second tied around his ankles. Suddenly, the action on the screens picks up pace. The spiral of dust beomes a reverse landslide. A man raises himself from the pile as it is sucked skyward. The woman on the rope is now being tossed from side to side with increasing violence, a rag doll in a tornado. The sputtering lights on the third screen greedily eat up the oxygen around them until the man in their midst is engulfed by an inferno; it’s reminiscent of Bacon’s Study after Velàzquez’s Portrait of Pope Innocent X. The young man on the ground is hoisted into the air feet first as water begins to pour down over him. Viola is one of a tiny number of people who can make great art devoid of irony, which is perhaps why his work is often exhibited in religious buildings (this is the third time he’s shown work at St Paul’s). Martyrs, which is to be joined by a second commission titled Mary later in the year, is intended to be a work of both contemporary and sacred art. It’s a great idea, and a beautiful series of videos. I just don’t think it works here. In the morning, the light from the window above it makes it almost impossible to see the images on screen. This inconvenience isn’t the problem, though. The videos are swallowed up by the magnificence of the setting. With St Paul’s, Christopher Wren froze the sublime in stone; walk up to the Whispering Gallery and feel the dizzying hit of terror and ecstasy that the word carries. Martyrs just can’t compete. It’s not that non-memorial art can’t thrive in the cathedral; across the quire in the northeast aisle, Henry Moore’s Mother and Child inhabits its space with dignity and humanity. The trouble is that it’s difficult to pay attention to moving images, even if they are as delicately executed as these. In its own right, it’s a fantastic achievement. Viola articulates human fragility and physicality like no other artist, and Martyrs holds true to this. Added to this is, as Viola makes clear, video is a potentially thrilling medium to explore the conflict between technology and spirituality. But Martyrs aims for something beyond intellectual analysis. In secular spaces, Viola’s work can indeed evoke the sublime – here, though, it’s rendered inert by the genius of Wren’s cathedral.